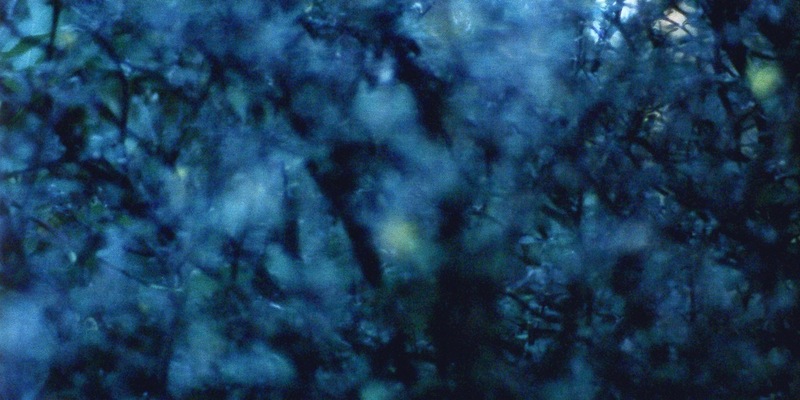 Nathaniel Dorsky, Monody, 2017, 16mm, color, silent, 16 minutes. Nathaniel Dorsky treats celluloid as a medium for ceremony—silence and light are concerns he has explored in his films since the 1960s. His latest work, Colophon (for the Arboretum Cycle) (2018), will screen at the Berkeley Art Museum and Pacific Film Archive in California on February 9, 2019.The entire Arboretum Cycle, which comprises seven films shot in the San Francisco Arboretum between 2017 and 2018, will also screen there on February 15, 2019. THERE WAS A DROUGHT IN CALIFORNIA for five years, and then in the autumn of 2017 there was a huge amount of rain. I went to the San Francisco Arboretum the following spring and realized I wanted to make a film about the way the plants there manifest in light or vice versa. I made Elohim, which is about an awesome sense of birth, with a burning bush quality—bushes inflamed with light, for instance—and the cycle came spontaneously out of that. I sent the footage off to the negative cutter, and two weeks later I walked into the garden and realized that it was becoming more adolescent, so I made Abaton and sent that off. Then the garden began to mature in the late spring. I made Coda, thinking that was going to be the coda to Elohim and Abaton, and then it was past the coda, and it was summer, and then there were the first qualities of death, things starting to turn red and drying out. I made Ode, and then it went on and on until I made Epilogue. The seven films were not planned, but it was a wonderful year to be involved almost week to week with the progression of the Earth. I didn’t want to make a film that depicted a garden or plants or flowers, but one where the film itself became like a plant that could fill with light. I began to let the aperture function in a way that paralleled the expressions of mood in the psyche. I could feel as a breeze was coming into the garden, and I would open the lens and let it fill with light, using the Bolex like a clarinet, and then I would feel in my own psyche fear or sadness, and darken the aperture, and then restart toward some hope of finding light again. When I was ten, back in ’53, I fell in love with Disney wildlife films; there’s one called Beaver Valley, and there’s another about the four seasons titled Nature’s Half-Acre. This was the first time I saw an animation of a flower blooming, that kind of magic. I realized that you could make one yourself. I had a neighbor, and we made films about animals in the neighborhood—we had an 8-mm silent film camera, and we’d go off with our bikes and our camera into a forest. Those Disney films were important early influences, especially in my twenties, when I was naming films after the seasons. I made three sound films in one year—Ingreen, A Fall Trip Home, and Summerwind; after that, I wanted to make a silent film. I went from trying to find a language within the pictorial image to looking for a language based on imagery that would activate parts of the psyche that normally aren’t activated by film. My friends in my late teens and early twenties were all autodidacts—we were seeing Stan Brakhage for the first time, and we took silence more seriously. He was making a syntax of everything that was wrong, like overexposure, underexposure, out-of-focus shots, jump cuts—it all became the positive language of a kind of poetry that was extremely vital at that moment. To us, sound cinema was a more socialized sense of yourself, whereas the landscape of poetry was your own psyche. We had the intuition that with silence there was the potential to create a film language that would be intrinsic to the nature of film—we all thought of cinema as a shrine, and Jonas Mekas was often trying to acquire an abandoned church or synagogue on the Lower East Side. We were interested in the possibility of a cinema Mass. The silence required more participation from the audience; they had to give themselves more, but they would get more. There’s a chance to go deeper with silent cinema.